April 21, 2008: At this year's Great Moonbuggy Race in Huntsville, Alabama, Prof. Paul Shiue of Christian Brothers University was overheard joking that duct tape was his team's "best engineering tool." Others felt the same way. The sound of gray tape being torn from rolls practically filled the race course as dozens of college and high school student engineers busily assembled and repaired their homemade moonbuggies. The date was Dec. 11, 1972. Astronauts Gene Cernan and Jack Schmitt had just landed their lunar module Challenger in a beautiful mountain-ringed valley named Taurus-Littrow on the edge of the Sea of Serenity. Mission planners chose the site for its geological variety: the ground was covered by a mix of giant boulders, hardened lava, orange glass beads (a sign of ancient volcanic fire fountains) and, of course, ubiquitous moondust. The valley itself was a fracture created in the aftermath of an asteroid impact billions of years ago; the history of the Moon, many suspected, might be written along its walls. Jack Schmitt, the first geologist on the Moon, could hardly wait to get started. About 60 seconds after touchdown, Schmitt radioed Houston, "Batteries look good," followed by a brief pause, and "Oh, man!! Look at that rock out there!" Within hours the two astronauts were down the ladder loading a raft of geology tools and experiments onto their Lunar Roving Vehicle or "moonbuggy." Everything was going smoothly until Cernan brushed against the rover; a hammer in the shin pocket of his spacesuit caught the buggy's right rear fender and tore half of it off. Cernan: "Oh, you won't believe it. There goes a fender." Now, a moonbuggy in Alabama can go just fine without a fender, but in Taurus-Littrow a missing fender was a potential disaster. The reason is moondust. When a rover rolls across the lunar surface, it kicks up a plume of moondust in its wake. (Astronauts called them "rooster tails.") Without a fender, the rover would be showered by a spray of dark, abrasive grit. White spacesuits blackened by dust could turn into dangerous absorbers of the fierce lunar sun with astronauts overheating inside. Sharp-edged dust wiped off visors would scratch the glass, making helmets difficult to see out of. Moondust also had an uncanny way of working itself into hinges, latches and joints, rendering them useless. 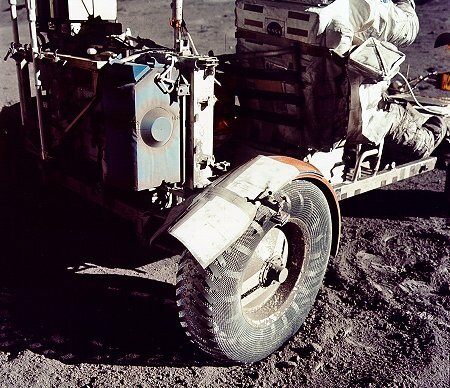 Above: Apollo 17 moonbuggy fender repaired with duct tape. Cernan: "Okay. I can't say I'm very adept at putting fenders back on. But I sure don't want to start without it. I'm just going to put a couple of pieces of good old-fashioned American gray tape on it...(and) see whether we can't make sure it stays." His second attempt succeeded, however. "I am done!" crowed Cernan. "If that fender stays on ... I'd like some sort of mending award." And with that, they were off. 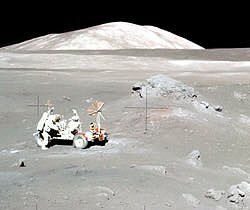 For the next four hours they drove the moonbuggy far and wide around the landing site, stopping to drill holes and collect core samples, deploy seismic charges and set up other experiments. Even with all four fenders, Cernan had to dust off the rover at each stop (mission planners provided a special moondust brush for the purpose). This soaked up many minutes of valuable time, but could've been worse as they were about to discover. Right: Gene Cernan works with his roll of duct tape. to view a longer movie with sound. Driving across a rough patch of lunar terrain, Cernan commented, "Man, you could lose the rear end of this thing in a hurry." And, indeed, the fender fell off again. Duct tape held it for a while, but moondust had reduced the tape's stickiness too much to hold on for a whole EVA (Extra-Vehicular Activity). Schmitt: "I think you have lost your fender. I keep getting rained on here (with lunar dust)." Schmitt: "Look at our rooster tail." Subsequent stops required considerable housekeeping. "Let me run around and dust!" 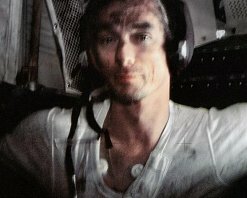 radioed Cernan while Schmitt deployed the Surface Electrical Properties (SEP) experiment. In a post-flight briefing he noted, "The dust on the battery covers and everything else was thick enough to write in. With a working fender you'd always got a light film of dust; but this was 'dirt' dust." Back at the Challenger, Cernan gave the parked rover a rueful inspection. "Oh, man, I tell you, it's going to take us half a dozen Sundays to dust. Look at that fender; that's terrible. Boy, that one fender just [creates] an order of magnitude more of a dust problem." Back in Houston, NASA engineers understood the seriousness of the situation. If they couldn't come up with a solution while Cernan and Schmitt slept, the next day's exploration could be severely curtailed. The astronauts might even be limited to walking distance. But they did come up with a fix and it called on, you guessed it, duct tape. When Cernan and Schmitt woke up the next morning, mission control explained how they should tape four laminated maps together in the shape of the missing fender. "Just call me the little old fender maker," said Cernan as he tore off pieces of gray tape. This time the taping was done inside the relatively dust-free confines of the lunar lander, so the duct tape retained its usual stickiness. Clamped to the moonbuggy, the new fender held for the rest of the mission, which included another 15 hours of EVAs. One dousing with dust was enough to make a deep impression on Schmitt. Back on Earth he opined that "the dust issue is one that just has to be addressed. It's going to be the major environmental issue for future missions to the Moon." Back to the future: Right now, NASA is preparing a return to the Moon and dust is very much on the agency's mind. NASA scientists are doing laboratory experiments with samples of Apollo moondust to discover techniques for "moondust mitigation." And a new NASA spacecraft named LADEE is devoted entirely to moondust. Short for Lunar Atmosphere and Dust Environment Explorer, LADEE will orbit the moon in 2011 or 2012 watching for "dust storms" thought to occur when electrostatically charged moondust levitates off the lunar surface. When next-generation astronauts go to the Moon, they'll know a lot more about moondust than their Apollo predecessors. But you can bet there’s one thing they won’t leave home without—"good old-fashioned American gray tape." Thanks: The author would like to thank Eric Jones who penned the Apollo Lunar Surface Journal, a must-read for historians of the Apollo program. Many of the radio transmissions and recollections reported in this story come straight from the Journal.